Today was a day that I will remember fondly throughout the entirety of my writing career. On this week, from Wednesday through Saturday, I was asked by my publications director to represent The Shorthorn at the 2014 Texas Intercollegiate Press Association Convention, an annual ceremony where not only the best work is rewarded in journalism and broadcast for the year of 2013, but competitions were held for reporters and writers to compete for the top spots in these competitions. I competed in three separate competitions, and at the end of today I walked away with two plain manilla paper awards that looked as exquisite as gold. I attended the previous TIPA convention back in April 2013, a novice who barely knew how to reference a source in the first draft of his story. This year’s TIPA was significantly different for me in more ways than one. First of all, this year’s TIPA was held at San Antonio, whereas the last convention was hosted close to home in Dallas. Second, I came to TIPA this year as an experienced entertainment editor, not as the idle and clueless reporter that I used to be. I had much more experience since the last time I came, and I was ready to combat any uncertainties that would come my way. Third, the only competition I was in during the 2013 ceremony was the critical review competition, where I attended a performance of some sort and critiqued it at the conclusion of the event. 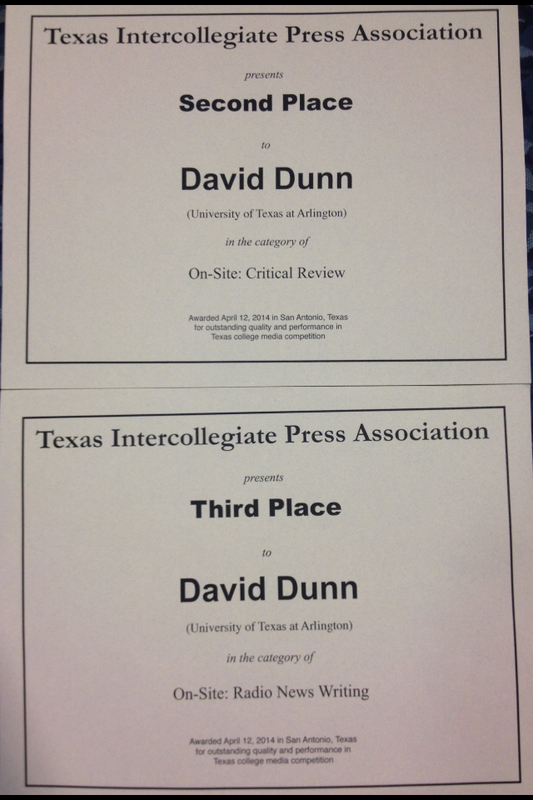 This year, I competed in three categories, including critical review, radio news writing and television anchoring. You have no idea how grueling the competitions were, how frustrating and nerve-wracking they were when you were on deadline and had only three minutes left on the clock. The day started off traveling to an off-site location for my news writing event, where myself and two of my fellow reporters and photographers came with for their own competitions. Our assignment was to cover an arson fire, only, it wasn’t a real fire: members of the San Antonio Fire Department put on a demonstration for us, showing what they would do for a real-life emergency situation, even at one point pulling out a humanoid dummy pretending it to be a real victim of a real-life arson fire. We witnessed the event, asked questions, left the event, and arrived back on-site to complete our respective assignments. My script had to be a 30 to 45 second copy, and knowing that three words equals approximately one second in narration, I knew that my script had to be somewhere in between 90 and 135 words. I was ten minutes away from script deadline, quick to finish my script so I could turn it in and conclude my event. I was very excited when my final copy was at 44 seconds, only to realize that my five-second sound cue at the beginning of the script made it 49 seconds. I panicked, looking frantically at my script, knowing full well that I would have to cut at least 12 words to make it fit the time frame. I scanned my document for seven nerve-wracking minutes, looking for any unnecessary words I could cut out. I ended up omitting five words, equating only to one second less of a copy that I had before. “Screw it,” I thought to myself. “I’ll cut the sound cue.” So I turned in a script with a one-second natural sound lead and 44 seconds worth of narrating material. I turned it in with the runtime exactly at 45 seconds. Later on that day, I went to the critical review competition, which was in a word, a wreck. Not the event itself, mind you, but the performance that they chose for us to review. It was a performance of Bruce Norris’ Pulitzer prize-winning play Clyboune Park, a story that looked at two different generations of racism and compared them side-by-side showing how nothing has changed. The problem was we only viewed the first half. The production ended Sunday April 6 of last week, with most of the cast returning exclusively just for our viewing. While I appreciated their involvement and the opportunity to review their production, with the second half missing I had no context to refer to. I left the theatre with an empty taste in my mouth, but with plenty of opinion to put into my review. Friday came along, and was a day where I was supposed to attend a majority of the workshops, where we were stressed the importance of internships, social media, adapting to industry standards and finding your voice. I learned a lot from the workshops I attended, and kept the information enclosed in my notes I took throughout the day. My day got interrupted, however, when I learned that a replacement was not found for one of my friend’s television anchoring competition. Not wanting The Shorthorn to be misrepresented at a competition that it signed up for, I gathered my things, a change of clothes, and quickly made my way to the competition, as it was one that I was previously interested in anyway. It was haphazard, chaotic, quickly assembled, and my clothes were so tight that I looked like a pound of sausage squeezed into a tube of toothpaste. But the point was I made it, I gave my best effort and I gained relevant experience that I can use the next time I compete. Then came along the awards ceremony on Saturday. Sitting down calmly with my vanilla coffee in my left hand, I sat back in a relaxed poise fully expecting to lose in every category. Quite the contrary: my name was called twice in a row, one for second place critical review, and third for radio news writing. My mind is still trying to grasp the fact that I won these awards. Firstly, I want to say thank you to everyone involved who inspire me to do the best that I can everyday in everything that I do. That includes Beth Francesco, our publications director, Lance Liguez, my broadcast professor, my fellow colleagues, and my mom and dad, who both remind me that the best possible job you can do is never enough. Secondly, I want to pay respects to my friends in newsroom publications who also walked away with widely-recognized awards. My editor-in-chief Lindsey Juarez walked away with first place feature writing, an award she rightfully deserved by crowd sourcing and finding a compelling story through a homeless man that moved from shelter to shelter from New York down to here in San Antonio. The Shorthorn’s sports editor Grant McKinley walked away with third place print sports writing, while his reporter Cassie Logan walked away with second place television sports writing. Our copydesk chief Chloe Gonzales won first place copy editing while many other staffers won a multitude of other awards, including photographer Adrian Gandara, our photo editor Richard Hoang, our current digital managing editor Jonathan Silver and many others, eventually contributing to The Shorthorn’s number one placement for best in show. Even my music reviewer Brian Peterson placed first in critical review overall for the year, although it was during his time at another publication, at Stephen F. Austin’s The Pine Log. Realize none of these awards were easy to come by. There were over 20 student publications represented at the convention. To even place in the honorable mentions is a stroke of sheer luck. Lastly, I want to thank you, the reader, for inspiring me to do what I do day in and day out. All I’m trying to say is that I’m grateful. I’m grateful for the people that I work with. I’m grateful for the publication I work for. I’m grateful for the job I have and the goals that I aspire to meet. I’m grateful for my friends, my family and my brotherhood for being so understanding with my long hours and work schedule and who are happy to see me when I come around. Yes, there’s a lot of unprecedented challenges I face on a daily basis, and yes, we as editors will sometimes get frustrated by each other by our antics and our work ethics. That doesn’t change the fact that we’re continually progressing as a student newspaper, and that you, the readers, are the reason why we continue to be in operation. That same reason is why this blog is still in operation, although on a much lesser scale. I can’t say this enough: thank you, thank you, and thank you for your continued interest in my writing career. Movies is my passion, and film criticism is definitely the career I want to pursue when I graduate college. Until then, I will continue to improve both as an editor and as a writer, and hopefully TIPA will be ready for me when I return in 2015. Post-script: Below are the award-winning samples that got me my two TIPA awards at this year’s conference. Feel free to read them, as they are probably more interesting than this four-page blog post.